Thank you to Dark Coast Press for inviting me to read at the 2012 Seattle debut of LitCrawl, a series of readings in bookstores and bars. DCP Editor-in-Chief Jarret Middleton, Gabe Blackwell, John Hamilton, Elissa Washuta and Corinne Manning joined me at Spine & Crown Bookstore to prove that words are intoxicating. 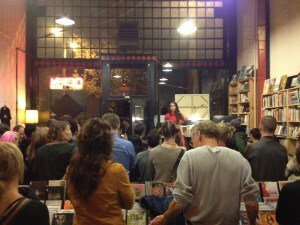 On Thursday, October 18th, many friends and unknown persons showed up to this tiny bookstore despite the rain. We all carried on down the sodden streets to the next venue, a mile away. Only in Seattle. © 2013 Kristen Millares Young.